Today I’m linking up with Leigh Kramer for her fun What I’m Into monthly post. 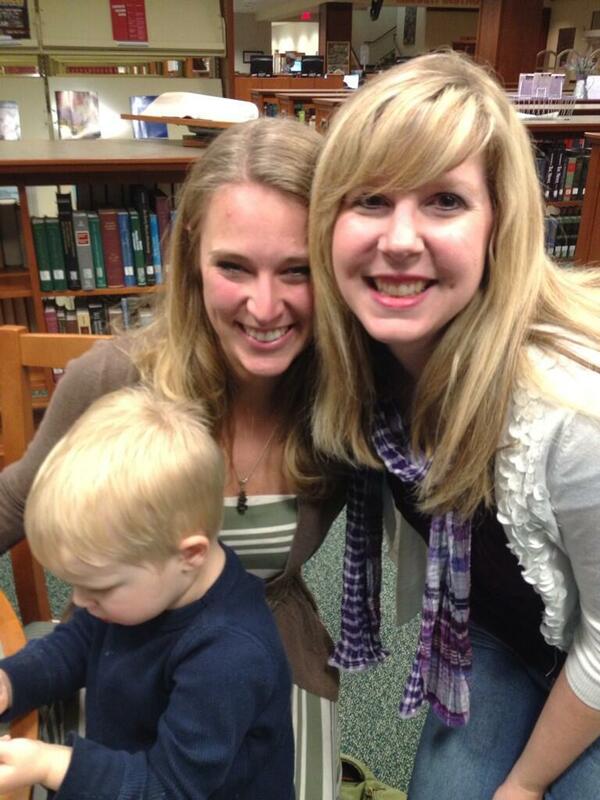 I had the pleasure of meeting Leigh briefly at Addie Zierman’s book reading and signing at Trevecca this month (more on that in a sec)! I really enjoy Leigh’s blog and have been having fun reading her Enneagram series (still trying to figure out which Enneagram type I am!). So . . . onto what I was into in February. I just read Eleanor and Park by Rainbow Rowell. 5 stars. Hands down. I absolutely loved this YA realistic fiction novel! Eleanor and Park are opposites in a lot of ways: she comes from a dirt poor, dysfunctional family and he comes from a stable (mostly – his dad is a little hard on him), middle class family. Despite their differences, they start to fall for each other. It’s a tough but really cool love story. I really appreciate that Rainbow Rowell writes teenagers well. As much as I love YA, I think that a lot of YA authors write teenagers unrealistically. Especially teenage boys. Rainbow Rowell was actually one the speakers at YALL Fest last fall and I can’t believe I missed out on seeing her! I also just finished another YA book called Paper Towns by John Green. Fabulous read. It is kind of a love story as well, but it’s also kind of a mystery. I love how this book addresses our perceptions of people versus how people really are once you get to know them. Sometimes we have people up on pedestals (especially if you’re 16 and in love) but then when you really see them, you realize they’re just a regular human like you. And that’s beautiful. Also in book news, this month I got to meet Addie Zierman, author of When We Were on Fire! This was SUCH an exciting night for me. I love Addie’s blog and book and I feel like we have so much in common as we both grew up in the 90s evangelical “on fire” culture, have MFA degrees, are raising young kids, etc. Also, I knew to look for Leigh Kramer there, too because I stalk her and Addie on Twitter and saw that they’d been hanging out earlier in the day. So I got to meet 2 writers/bloggers I love! It was such a great night! Also, I’m reading Gregor the Overlander with Madeleine right now. It is written by Suzanne Collins (of Hunger Games fame). 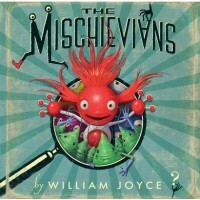 It is a great middle grades book that even boys would enjoy. Gregor (12 yo boy) has fallen underground into Underland and is on a great adventure with rats, bats, spiders, and giant cockroaches. It’s awesome. Ephraim is really into William Joyce books right now. 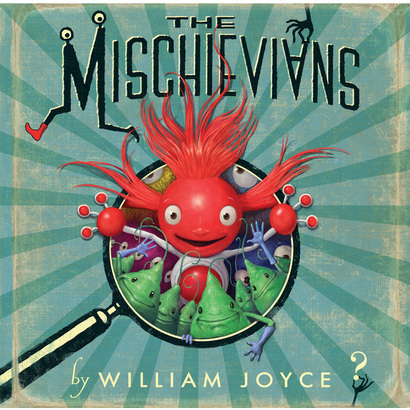 His favorite is The Mischievians, which are members of a race of creatures who stir up mischief (e.g., they clog your toilet, hide your remote, and make you stink). I got nothing. I don’t think I’ve even kept up with my regular shows this month. And the only Oscar nominated movies I’ve seen are the kids’ movies. Pitiful. I am loving Bastille right now. Their song “Pompeii” is really popular on the radio right now, but the entire album is just great. I love their sound and their lyrics. Steven and I agreed to not get each other anything for V-day this year. A long time ago early in our marriage there was one Valentine’s Day that Steven said, “Valentine’s day is just another day.” I got SO mad at him for that. Guess what? Now I think that Valentine’s Day is just another day. I love him just as much on Feb 14 as I do every other day. I don’t need to be lured into buying crap in order to show him I love him. BUT he did get something for us on Valentine’s Day – Weezer tickets!!!! The show is at the Ryman in April and they are playing the entire blue album. AAHH! 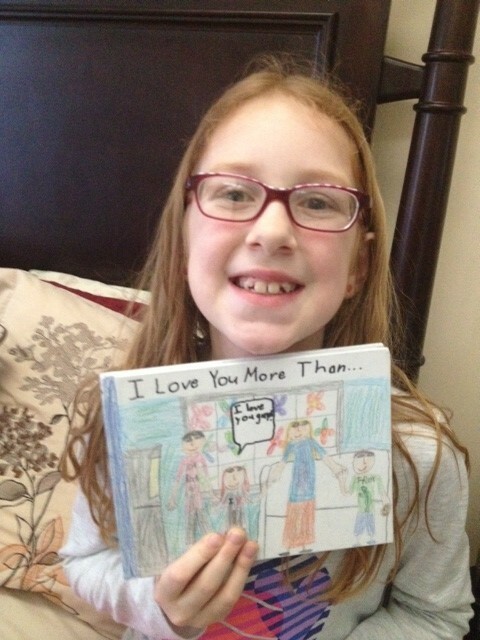 Madeleine gave us a book she wrote and illustrated herself for Valentine’s Day titled “I Love You More Than . . ” See pics below (shared with her permission). Her humor really comes out in this book. I think I have a budding comedian on my hands. 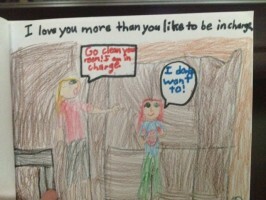 “I love you more than you like to be in charge.” Wow. I’m winning at motherhood. We had a couple of warm days recently and the kids and I spent 3 hours outside. It was glorious. We played on the playground, chalked up the sidewalk, played with the dogs in the backyard, and played both golf and baseball (well, with wiffle balls) in the front yard. I did a terrible job of pitching to Mad, I didn’t catch the ball once, and Ephraim had to remind me to run when I hit the ball. I did not take one picture and I don’t apologize. I was living in the moment. I have spent most of February testing secondary EL students. It’s the time of year when all ELs take their proficiency test to see how much their English has grown since last year. It’s been really cool to visit schools I’m not normally at and meet kids from all over the world. I wrote a little about my experience at the adult high school in this post. Best quiz: Which LOST character are you? I got Desmond. Which I’m totally cool with. I had a piece published at Catapult Magazine this month called Tasting Thailand. I am still slowly working on last revisions for my book and hope to send out queries to agents soon. On the blog, I have an exciting series starting next week called Wednesday Wrestling. I will have a guest writer/blogger each Wednesday of Lent to address the idea of wrestling. (Mental/emotional/spiritual wrestling, not like WWF/WWE.) Make sure you check back to read each post! I loved reading this! (visiting from Leigh Kramer’s) I’m so jealous of your Weezer tickets. Also, I took the LOST quiz a few days ago and got Locke. Apparently, I’m pretty intense. 😉 Looking forward to reading more of your blog. Thanks for reading, Mallory! I love Locke, too. I also read Eleanor & Park last month, but I had mixed feelings about it. I think my negative feelings mostly came from her life situation – I don’t deal well with that sort of story, regardless of where I find it. It was almost too painful for me. BUT, I agree about the way Rowell writes teenagers. It took me back to being a teenager, feeling everything so hugely, but seeing everything from such a limited perspective. I’m going to read more of her writing, for sure. I didn’t like her life situation, either. It was hard to read. But I’m also glad that she found a way to escape, and she had at least one person in her life who valued her. Great post! I read your article at Catapult – loved it! I haven’t read Eleanor and Park yet, but its on my list. I’m also going to read Fault In Our Stars soon. Thanks, Sarah! I love everything by John Green. I’m so anxious to read Eleanor & Park! It’s been on my list for quite a while, but I still have a ways to go on the library reserve list. Apparently it’s popular with the real people I share my library with and not just the internet people I share the blogosphere with! Mary, the book doesn’t disappoint! 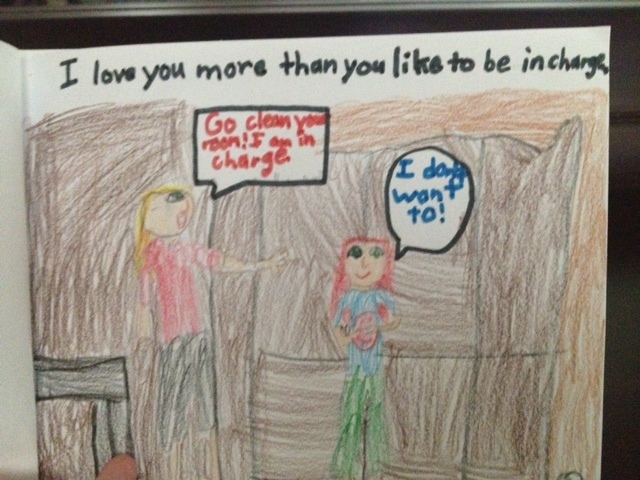 And yes, my daughter speaks the truth. I try to tame my control freak side, but it’s a bit wild at times.